These pie irons are such a fun summertime cooking utensil. You can make almost anything in them and they are perfect for single size portions. Kids love to create their own snack, meal or dessert and best of all there is virtually no clean up! 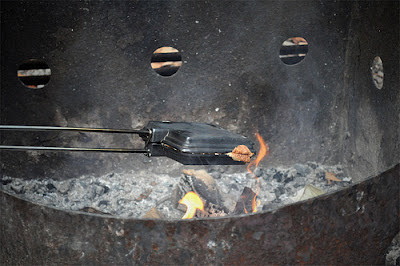 Simply stuff the pie iron with your desired recipe and cook over an open fire. They are great to bring along camping or just to use at your own back yard campfire! Here is our favorite recipe brought to us from my sister in law....we thought she was crazy but trust me its good! Sandwich everything together in the pie iron and toast over campfire.